We offers the most robust and comprehensive electronic signature solutions available to automate your external and internal processes. Our hardware products and free software are designed to allow seamless integration and ease of scaling with your growing e-signature demands, no matter where or how the e-signing process occurs. New products include ‘virtual serial’ units. These are serial units with internal USB-to-Serial convertors allowing them to be plugged into USB ports and used with Citrix or Terminal Services. 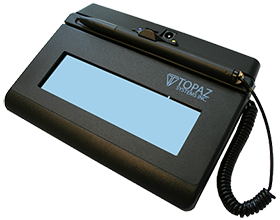 New technology includes large-screen signature capture pads, behaving essentially like a second monitor for a PC, but able to also capture data and signatures at a forensic level. With the miniaturisation of technology, new large screen WiFi units have been released including 4×3 and 4×5 LCD models. The new software emulation can work under iPad and MAC/OS as well as a version for Windows.